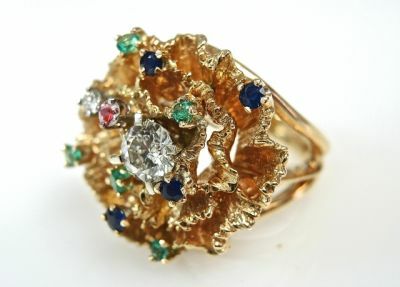 A beautiful 18kt yellow and white gold floral design ring with 1 round brilliant cut diamond, est. 0.63ct (clarity:SI1 & I colour); 2 round brilliant cut diamonds, est. 0.10ct (clarity:VS & G-H colour); 4 round facetted cut deep blue sapphires, est. 0.24ct; 5 round facetted cut medium yellowish green emeralds, est. 0.27ct.